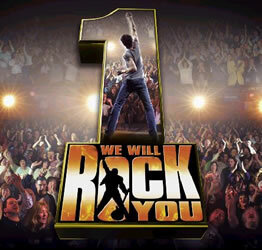 Guide to the London stage musical "We Will Rock You "
This page is a brief guide to the stage musical We Will Rock You. 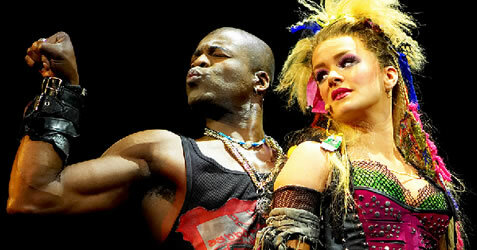 Its opening night was in London in May 2002. The running time (including the interval) is 2h50. The Bohemians are rockers who live underground at the Heartbreak Hotel, plotting the overthrow of Globalsoft and the return of "real music". They are named after rock / pop stars such as Britney Spears and Meat Loaf. English: The story is easy to understand, but there is some slang and there are lots of references to British popular culture. 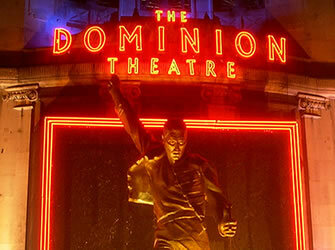 Age: This musical will appeal to teenagers or adults of all ages who like Queen's music. There are some sexual references. Mood: A "feel-good" show which is like a mixture between a live rock concert and a light-hearted play. Music: The songs are all by the rock group Queen. 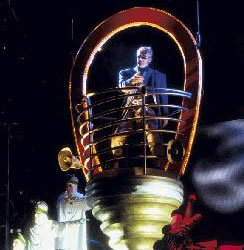 There are short sections of speech between the songs. The music can be quite loud at times, so if you are sensitive to this take something to protect your ears. Queen is a British rock group formed in the early 1970's. 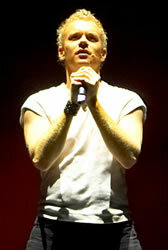 The lead singer was Freddie Mercury, who died in November 1991. The other members of the band are the guitarist Brian May, drummer Roger Taylor and bassist John Deacon. From 2005 Brian May and Roger Taylor have performed together with Paul Rodgers (best known as the former singer/songwriter of the band Free).